I am so glad to be back with you this week. Friday’s post never got written, because last week was just crazy from getting back into our routine after vacation, to Gus having two tests last week at our local hospital, Bryan was out of town for a day, and we were all just so tired! Needless to say- this week, I am playing catch up! So I thought I would just share a hodge podge of random things with you this week. First things first- March 21st is World Down syndrome day! We invite you to celebrate with us by wearing blue and yellow and/ or crazy socks and tagging us in photos on social media. 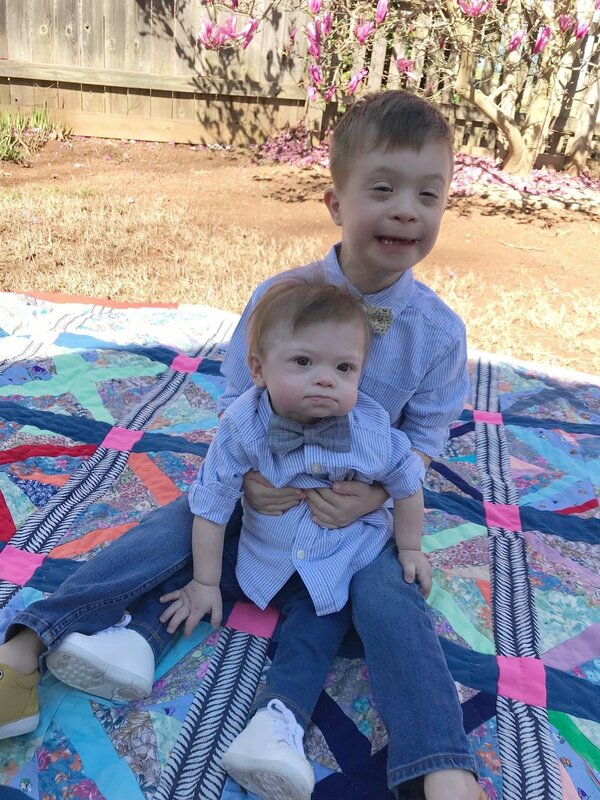 World Down syndrome day is a big day in our home and we love seeing people from all over celebrate with us! They just weren't feeling it- but their shirts are cute! Jude and Fi- My friend Shannon, owns this sweet little shop. She makes the best hair bows and clips (that stay in!) I’ve gifted several to my niece. She also makes my favorite coffee coozie, and probably my favorite thing she makes are these sweet bow ties. A portion of her proceeds this month are going to Ruby’s Rainbow, which y’all know is near and dear to my heart. Check out her store, and pick up something cute! Next I wanted to share with you that I have been getting so many questions about Disney lately that for the next 3 Fridays, I will be sharing Disney posts like: How to Date at Disney, Vacationing at Disney without going to a Park, Where and How to eat at Disney World- especially if you have dietary restrictions. Let me know if you have other Disney questions, I would be happy to extend this series. Also look for some spring mommy- wardrobe updates, and how I felt about the 3 day juice cleanse I just did. Can you guys tell I am ready for Spring already? Lastly, I made this blueberry crisp yesterday. I had made it before, but remembered how much I loved it when Rebekah Lyons posted about it on her instastories, and I added the ingredients I needed to my instacart immediately. It makes me so excited for spring- and all things lemon and blueberry. We served ours warm with yogurt on top (Greek for me and coconut for B) If you are looking for a yummy, easy breakfast- look no further! Pour the berries into a baking dish—I used a pie plate. In a separate bowl, mix the remaining ingredients with a fork, and then pour it over the berries. Bake at 350°F for 30-40 minutes, or until just a little brown. If you’re waiting for a deep rich brown, you’ll be waiting forever, so just pull it out when the fruit is bubbling and there’s a little golden color on the crisp. Thanks for being patient with me friends. When I feel so pressured to get a post up and something happens, I beat myself up. Thankful that I am learning to give myself grace on this blogging journey. And learning to realize that I am a wife and momma first. Mar 7 Ruby's Rainbow 3/21 Pledge!